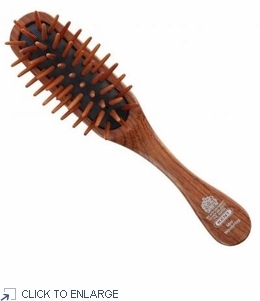 KENT Mini Woodyhog Hairbrush - Cushioned, Rosewood Brush - Handcrafted in England Cushioned, rosewood brush with wooden quills Taming, de-tangling and styling medium-thick hair. Our Mini Woodyhog made from rosewood, has proved its versatility for all the family, whether in the home, handbag or sports bag. The air cushioned head protects the scalp from damage, whilst the wooden quills gently glide through knots. This fantastic brush is tough and dependable, and can tackle any hair length or texture, wet or dry. Note: Hairbrushes, combs, shave brushes and razors cannot be returned due to hygiene concerns. UPC 5011637001013 Made in England. Our Mini Woodyhog made from rosewood, has proved its versatility for all the family, whether in the home, handbag or sports bag.